UDM Downloads > Private Room! 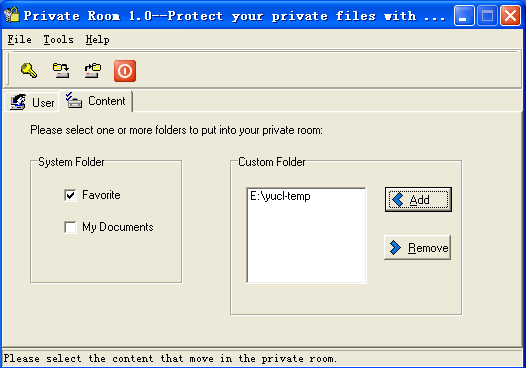 protect folder or files password easily,open on any pc. own private data-space. Let you own a private data-space. you can open it on any PC at any time! Let you own a private data-space which you can take along with you. And, you can open it on any PC at any time! Keep you private information secret (for the family customer), Transfer data safely and conveniently (for the office personnel). Create a private room on your PC In the realistic living, you maybe own a private drawer, that's your secret. Now, you could own you private room on PC. When you leave the computer, it can prevent your private data to be stealed by anybody. And, you can take it along with you.